Rhonda Robb If you do not hope, you will not find what is beyond your hopes. Welcome to 11th Grade English. I look forward to working with all of you this year. This will be my first year teaching high school students. However, I am not new to teaching. I was previously a Humanities instructor at The Ohio State University. Speaking of OSU (Go Buckeyes! ), I earned a bachelor's degree in English, Film Studies, and Women's Studies and a master's degree in the Humanities from Ohio State. My interests include reading, writing, cultural studies, movies, and bike riding. 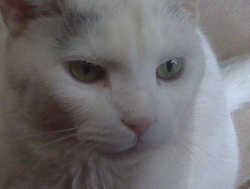 I enjoy spending time with my family; my friends; my three dogs--Wu, Zoey, and Baptiste; and Onion, my 13 year old cat. My favorite U.S. novel is An American Tragedy (1925), by Theodore Dreiser. 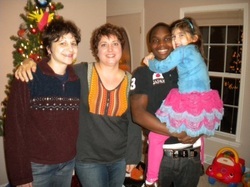 From Left to Right: Natalie, Me, Natalie's son, Floyd and her niece in the pink skirt. 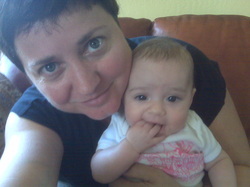 This is me and my great niece, Maria. I'm in the pink hat and that's Natalie in the blue hat. We met in 7th grade. We went to middle school and high school together many, many years ago. She's also an English teacher. 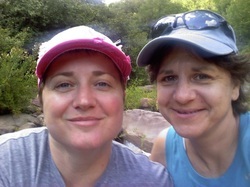 In this photo, we were half way through our 25 mile bike ride at Jim Thorpe, Pennsylvania. 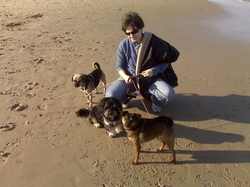 That's Natalie at Virginia Beach with our three dogs--Zoey, WuWu, and Baptiste.